In the world of web usability, one name comes to mind above all others: Jakob Nielson. 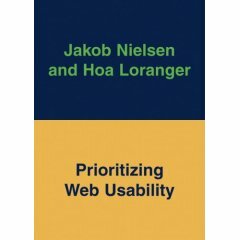 His recent book in conjunction with Hoa Loranger is titled Prioritizing Web Usability. Jakob Nielson runs the website useit.com and holds a Ph.D. in user interface design/computer science from the Technical University of Denmark. In 2000, Jakob Nielsen, the worldâ€™s leading expert on Web usability, published a book that changed how people think about the Webâ€”Designing Web Usability (New Riders). Many applauded. A few jeered. But everyone listened. The best-selling usability guru is back and has revisited his classic guide, joined forces with Web usability consultant Hoa Loranger, and created an updated companion book that covers the essential changes to the Web and usability today. Prioritizing Web Usability is the guide for anyone who wants to take their Web site(s) to next level and make usability a priority! Through the authorsâ€™ wisdom, experience, and hundreds of real-world user tests and contemporary Web site critiques, youâ€™ll learn about site design, user experience and usability testing, navigation and search capabilities, old guidelines and prioritizing usability issues, page design and layout, content design, and more! Prioritizing Web Usability , is easy to follow and can help website owners to improve the usability of just about any site in existence. Although it is a book, it works as a guide giving specific examples of what works and what doesn’t. You never have to read from front to back to get useful information. It is interesting enough that it would be easy to read from front to back, but it is easy to use the book only on the specific areas of your website that you want to work on. This book is an excellent compliment to Jakob’s earlier book, Designing Web Usability, which is also a must read for anyone involved in web design, SEO, online marketing and other related fields. While this book is very thorough and detailed about usability on a site level, it goes beyond simple usability on a website. Topics such as optimizing and pricing pay per click ads, ad placement click rates, actual reasons to improve a website, writing content, detecting and using specific information such as user connection speed, and hundreds of other topics. Everything topic in the book is thoroughly explained, and backed with specific examples and statistics where appropriate. Overall, this could be the only resource a savvy website owner needs to make their website very usable. Starting from the area that plays a top three role in importance on most websites, formatting submission forms on your website. The books explains exactly how your forms should look and be formatted, so that they are easy to use and well understood. Next moving to the actual products that you sell, you can see specific examples of the best way to lay out categories and individual products on your site. You will learn how to write good product descriptions, and while you are writing content, Jakob tells you how to write good content for the rest of your site. Now, you can clean up your global navigation, and optimize your search function on your website. After standardizing your links, and making your text more readable, you can get rid of that extra flash that you really don’t need, as well as those pop-up windows that really don’t do anything for you. Finally, after checking through the usability killers that Jakob outlines, you have a usable, cleanly formatted and professional website. You can now go out and focus on your marketing and driving traffic to your site, knowing that if you don’t have any sales, it’s not the fault of your website’s usability. What I really like about Jakob’s beliefs and standards is that he bashes the heavy use of graphics and media that is commonly seen on websites. While I often take criticism from people by following his advice and not using a lot of images in the layout of my sites, the results truly speak for themselves. Buy Prioritizing Web Usability today. There are several interesting articles that I have seen today. Seth blogs about a lack of organizations or individuals, that tweak existing websites. Not full re-designs, but people that work only on the small stuff. I have to agree that this could be a great Niche for a competent company to fill. I’m not sure how a company would effectively market themselves, but word of mouth seems to be an efficient way to market a company like this. I imagine that once you get going, the referrals could be huge. CakePHP is a Ruby on Rails equivalent for PHP. Oatmeal from seomoz reports on a website that they recent re-designed using CakePHP. It looks like an amazing platform to publish with. I’m not sure how widely it will spread as it requires a fairly involved installation procedure and the learning of its proprietary sub-language within php. The benefits may definitely be worth the effort to learn, especially if it catches the mainstream php developing world. Buying text links for relevant traffic! If you are moderately up to date in the world of SEO, you would know that there exists a lot of debate about the effectiveness of purchasing text links for a website. While buying links used to be a great way to get a website up in the rankings, it isn’t nearly as effective any more and can have negative effects on a website if the linking is considered spam. So taking the ‘bold’ assumption for this post that there can be no positive SEO benefit from paid links, can it still be worth it to purchase text link advertisements? Websites that lack trust are often plagued by low sales, and low conversion rates. If visitors don’t immediately trust a website they will leave, and not come back. New sites have a harder time gaining trust because they don’t yet have a reputation or any reason for a visitor to think they are trustworthy. 10 Ways to ruin visitor experience on your website. After a few weak opening posts, I am going to kick off the blog with something that I think is actually useful for ecommerce website owners: 10 Ways to ruin your visitor’s experience on your website. In one of the most thought provoking posts I have ever read, Seth Godin posts that businesses should compromise less and not compromise more. This advice can be applied to just about any objective to make it more successful. How many times do you visit a business, or a website and they passively force you down their narrow hallway of options. Do your customers a favor, make products and services based on what they want, not what you want.